So last night I stayed up way later than I should have in order to go to the MG & YA author panels being hosted by Boston GLOW (Girls Leadership; Organized Women) where the theme was strong female characters in fiction. It featured AMAZING authors and was an informative, encouraging evening. If they do it again next year and you are in the Boston area you must go. 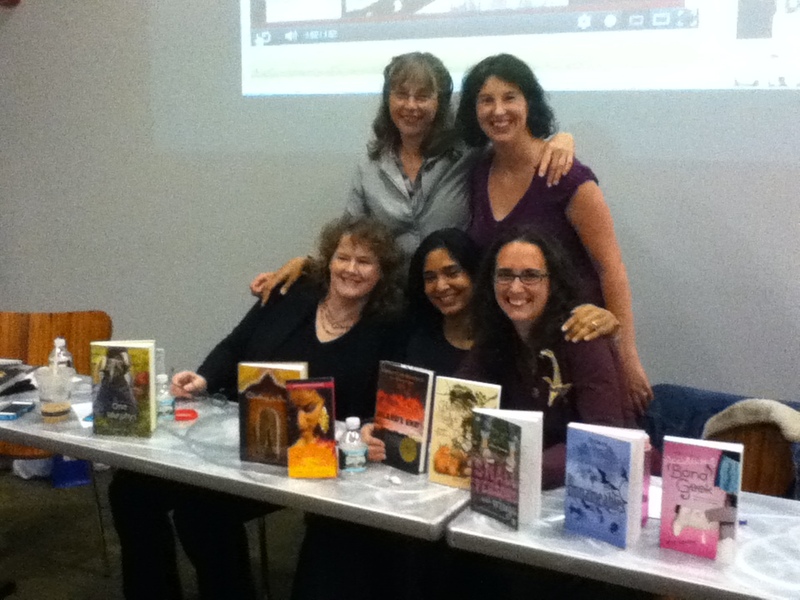 Front row: Lynda Mullaly Hunt: One For The Murphys, Padma Venkatraman: Island’s End & Jennifer Carson: Hapenny Magick. Looking at writing causes us to reexamine how we look at the conflict in our own lives: conflict is what takes us from where we start and turns us into the character at the end of the book. Get to know your protagonist really well, so that you know when to have them respond to a challenge from a place of weakness or a place of strength. The key to character in a novel: Distinguish between a character’s values and habits. Then get him or her to change their habits while keeping their values. Character is plot. Setting is also plot. Thanks to everyone who made the night possible! This entry was posted in Interesting People, My Crazy Life, Writing. Bookmark the permalink.